The 2018 Annual Dinner is our premier networking event of the year, bringing together over 1,000 investment professionals and key decision-makers. The Officers and Directors of CFA Society Chicago invite you to attend this year's event where you will have the opportunity to socialize with individual members, celebrate with the new class of CFA charterholders, and show support for the CFA designation and for the Society. You are invited to attend the Annual Dinner at no charge courtesy of CFA Society Chicago. In order to take advantage of this special offer, you must be approved as a new Charterholder member and join CFA Institute and CFA Society Chicago by October 1, 2018. Please contact CFA Institute directly with any questions about your status at 800-247-8132. 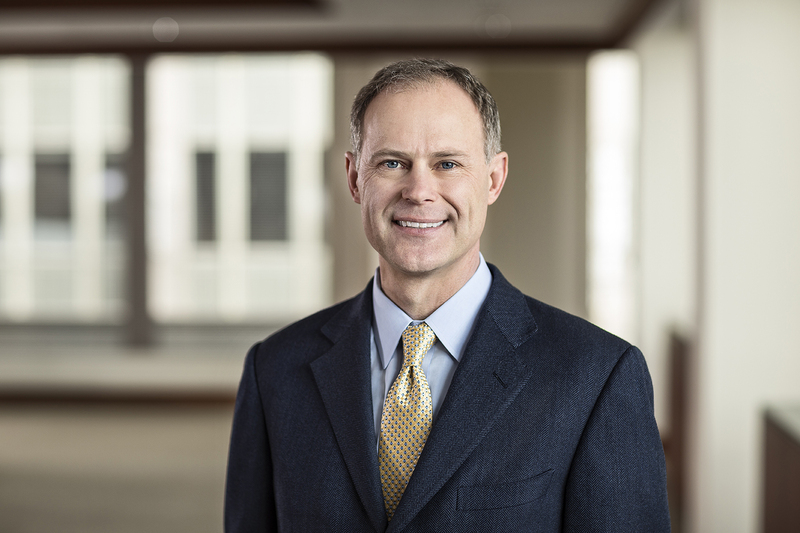 Brian Singer, CFA, is the head of William Blair’s Dynamic Allocation Strategies (DAS) team, on which he also serves as portfolio manager. Before joining William Blair in 2011, Singer was the head of investment strategies at Singer Partners, LLC. Before that, Singer was the head of global investment solutions and the Americas chief investment officer for UBS Global Asset Management, where he was a member of the UBS Group’s managing board and global asset management executive committee. Singer is extensively involved with the CFA Institute. 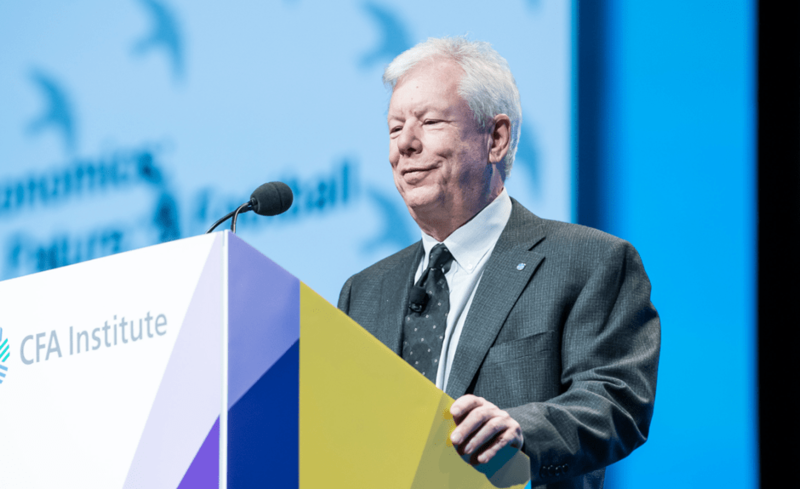 He formerly served as a board member and chair of the CFA Institute board of governors. He is a member of CFA Society Chicago and a former chair and member of the CFA Institute Research Foundation Board of Regents, and in 2015, he received the CFA Institute’s Distinguished Service Award, which recognizes CFA members who have made a significant contribution to the CFA Institute through their leadership, exceptional stewardship, and outstanding service. Singer has written extensively on global portfolio, currency, and performance issues, and co-wrote the seminal Determinants of Portfolio Performance II: An Update with Gary Brinson and Gilbert Beebower. In 2009 Singer was the lead author of Investment Leadership and Portfolio Management from Wiley Publishing. In 2015, Singer was inducted into the Performance and Risk Management Hall of Fame by The Spaulding Group. Singer serves on the endowment investment committee for Exeter College at Oxford University; he is chairman of the “Free to Choose Network,” which is inspired by the ideas of economist Milton Friedman; and he serves as a member of the Rehabilitation Institute of Chicago Keystone board. Singer received a B.A. in economics from Northwestern University and an M.B.A. from the University of Chicago’s Booth School of Business. A small block of rooms have been reserved for the evening of Thursday, Oct. 25, 2018 at a $229 rate (single/double occupancy). 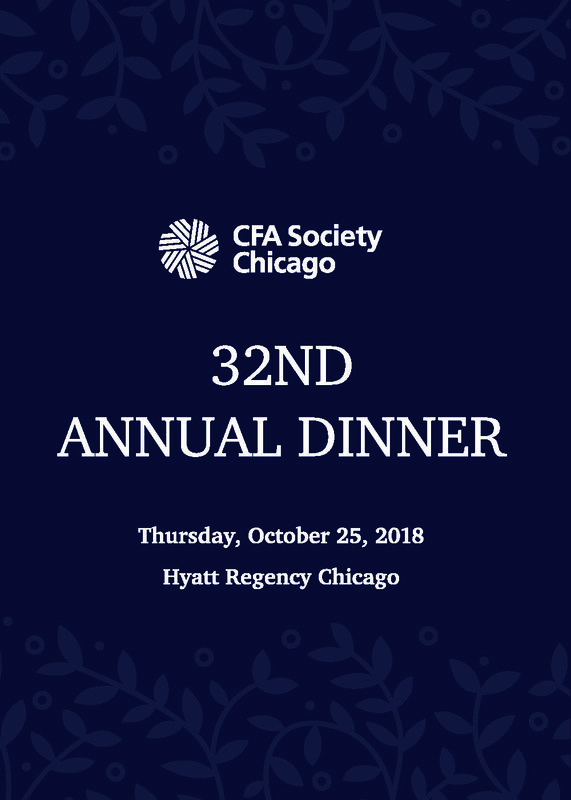 Reservations may be made, modified or canceled by individuals by calling central reservations at 1.888.421.1442 and refer to the CFA Society Chicago Dinner or book online at https://book.passkey.com/go/CFASocietyChicago to receive the special rate. Reservations must be made on or before Sept. 25, 2018. Transportation: $32 valet parking available at the hotel (mention CFA Society Chicago). Self-park is also available at garages within two blocks of the hotel (rates will vary). Limited sponsorship opportunities available - For more information, view the 2018 Annual Dinner sponsorship brochure or contact Kim Augustyn at sponsorship@cfachicago.org. Our appreciation is also extended to the Bronze Level Sponsors for their support of the 32nd Annual Dinner! Credit card required to guarantee ALL reservations. No day-of-event registrations accepted. Visa, MasterCard, American Express, Discover and Diners Club are accepted. Cancellations accepted until 5:00 pm, Oct. 4, No Walk-ins. New charterholders: If you do not cancel before the deadline and/or you do not attend, your credit card will be charged a $125 no-show fee.